"Don't tell them it's horse poo," Bininj woman Mandy Muir leans in close and whispers this to me. "We'll keep them thinking it's buffalo and keep the buggers on their toes." We're traipsing up and down narrow, red dust trails: city folk a long way from our urban comfort zone. In truth, we're actually not far from the Patonga Homestead Aboriginal Community, but that doesn't mean we're necessarily safe in this part of Australia. Bush tucker round here comes in all shapes and sizes: it grows on trees, and it's spread across the earth. We're foraging for the tastiest bush tucker we can lay our hands on; and the only thing that will stop us is if we're attacked by Kakadu's most dangerous local, the wild buffalo. 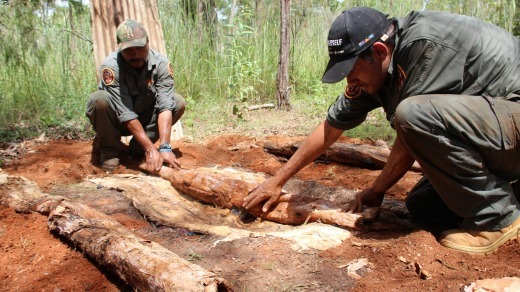 Ranger Fred Hunter uses paperbark to cook buffalo shoulder in a traditional underground oven. Muir tells us she saw a few out this morning – and we've just been shown fresh tracks in the earth – so when we stumble upon a patch of still-steaming dung the size… and shape… of a rugby league football, the group draw their own conclusion. "If we see a buffalo, you're on your own, I'll be running," Muir warns. But she leans in conspiratorially again: "They're way more likely to get attacked by these, I reckon," Muir puts her hands in the ochre dust and drags up a handful of green ants which she puts straight in her mouth. "Feel free to eat them, they're not for everyone, but I love them," she says, chewing and pursing her lips to spit out the heads. This patch of terra firma is like Coles without a check-out. Muir's plucking black plum berries – showing us which ones will poison us ("not that one, it'll cut your throat") and which berries are as sweet as local honey. 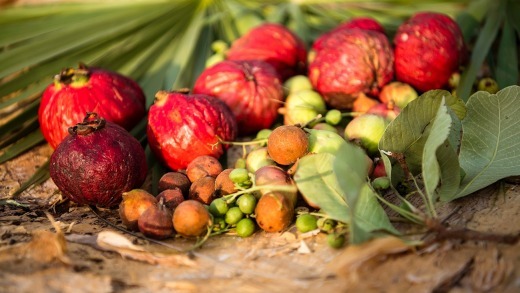 There's herbs and spices I've never heard of, and the planet's latest superfood craze, the Kakadu plum. We pick it all and take it back to the homestead to mix it with the black bream and barramundi two local Indigenous blokes caught this morning in the billabong up the road from here. Local Bininj chef Ben Tyler, who heads up Kakadu Kitchen with business partner Kylie-Lee Bradford, is in charge of the feast, he's sprinkled what we've gathered onto the fish, then he's tossed them whole onto white-hot coals in a newly dug fire-pit and covered it with paperbark leaves. It's taken a long time – 219 years to be precise – for an annual food festival celebrating Australian Indigenous cuisine like this one. A Taste Of Kakadu will celebrate its second year in May and has already become Australia's premier traditional food festival. There's nowhere better in Australia for non-Indigenous to get their heads – and their mouths – around the nuances of the ancient Indigenous diet. For five days, visitors will journey across Kakadu to study the landscape which inspired the diet of Indigenous Australians. And for five days, they'll eat the animals – and the dishes they come served up in – that Indigenous people have eaten for tens of thousands of years. "There's so much food out here," local Indigenous woman Patsy Raiclar tells me. "People don't realise things about us, they don't know we've been making our own bread since before the Egyptians did. My grandparents' grandparents taught them all these things, and their grandparents before that, all the way back 65,000 years." Tyler says Indigenous food is the future for Kakadu, and A Taste Of Kakadu is the key to that. 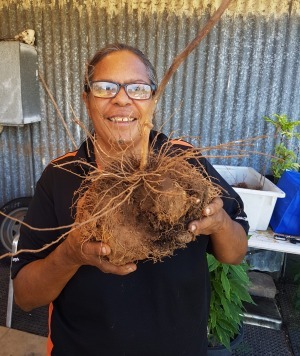 "With the mine shutting down (the main uranium mine at Kakadu – Ranger – is set to shut down by 2021), showcasing Indigenous food is what will lead us forward, and give our young people something to strive for. It's as important for us to remember how our people got and cooked their food as it is for you to see how we do it. This will be the Indigenous food capital of Australia, you'll see." 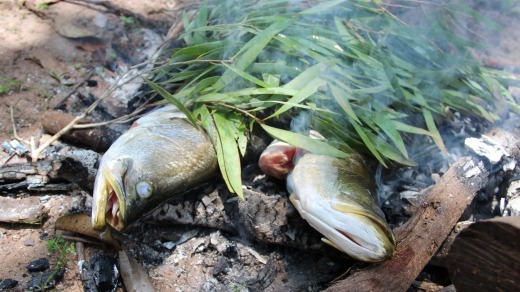 Barramundi on an open fire. Kakadu National Park is hardly a secret – not since Croc Dundee turned this region into a tourist gold mine as bountiful as any uranium mine – but A Taste Of Kakadu gives visitors an insight into the place which goes far beyond the World-Heritage-listed national park. I can't help noticing sprawling bitumen car parks beside Kakadu's main attractions which swarm with tourists come every dry season – I feel lucky to go beyond the coachloads of camera-wielding tourists with their sensible walking shoes, and into a side of Kakadu which visitors rarely get to see. Like this morning, for instance, when I helped Indigenous ranger Fred Hunter dig a traditional underground oven and bury a shoulder of wild buffalo. At dawn we dug the pit, then Hunter started a fire; when the coals were blistering hot, he wrapped the meat, and yam, and sweet potato, inside paperbark. Then Hunter buried it all over again and told us to come back in six hours. "Is this what they call slow cooking?" he asks. "We learn this as kids, I did my first one when I was 12. You can't just lift the lid and check on the meat, you have to know what you're doing." I'm back at noon. Smith digs at the dirt with his hands, already I can smell the aroma of roasted meat. He rolls smouldering rocks away, and notices a tiny hole in some of the four layers of paperbark. "You might find a couple of crunchy bits in there," he says. "But I bet the meat will peel off the bone." He unwraps the feast slowly, and I hold my breath. But the meat's cooked just right – like it always is – and for the next half hour we eat without talking, beating the flies to the spread. It's not always rough, mind you. A Taste Of Kakadu showcases the skills of Australia's most gifted practitioners of this type of food, who deliver a whole new take on the farm-to-plate experience. 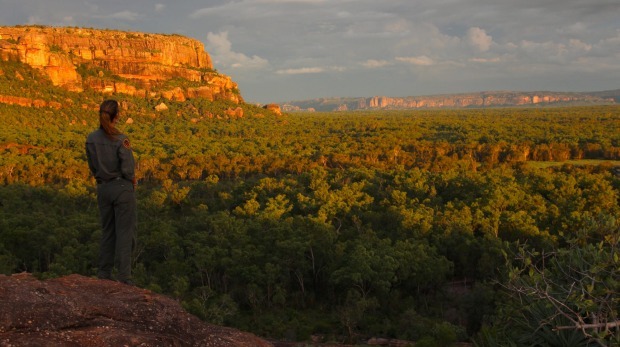 Last year, for instance, Indigenous chef Paul Iskov took 40 guests to a remote part of Kakadu National Park which had been shut off to the public for 20 years. 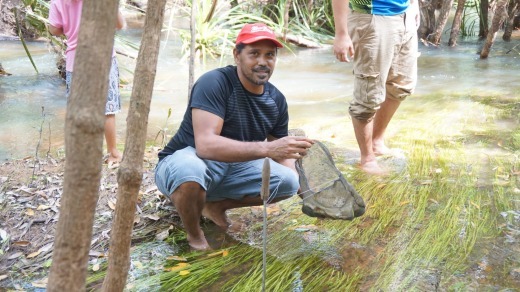 He served a 10-course degustation menu after making guests forage with him for last-minute garnishing for a menu dominated by emu, crocodile and locally caught fish. This year, nobody knows where he's taking guests – the location is a safely guarded secret. Though I have a sneak preview at a possible location, where I'm transported by boat over a swollen river, past crocs the size of our vessel, and into a van which takes us to a walking track where I pass by rock faces and caves covered in art that's tens of thousands of years old. The best chefs at the festival, including Darwin Indigenous cooking icon (from Elijah's Kitchen) Zach Green, will also be serving canapés on a late afternoon boat cruise across the national park's most spectacular wetland ecosystem, Yellow Water. Part of the South Alligator River floodplain, the barramundi fishing doesn't get a whole lot better anywhere than in here during run-off season, which ends at the start of May. Almost one third of Australia's bird species can be found around here – including hundreds of thousands of Indigenous locals' favourite kind, magpie geese ("tastes like the best sort of chicken you ever ate," Mandy Muir tells me), though it's the salt-water crocs I watch far more closely, since they seem to be sizing me up for canapés. Ben Tyler leads a bush forage. Green's best known for his sweet chilli mango mud crab, though I'm as partial to the green ant cheesecake he serves up with green ant ice cream. "There's a food festival for just about every culture that ever made it to Australia," he tells me one night. "I reckon it's time everyone got to know how good our food is too, and how good it's been for thousands of years." 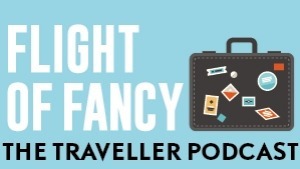 Craig Tansley travelled as a guest of Tourism NT, Kakadu Tourism and Parks Australia. Virgin and Qantas fly direct to Darwin from Sydney and Melbourne, see virginaustralia.com.au and qantas.com.au. Kakadu National Park is located 250 kilometres east of Darwin on a fully-sealed road, most major car hire companies operate out of Darwin airport.